Last edited by ganseg; 01-04-2011 at 10:08 PM. I am also very interested. This is exciting, as I was not sure there would ever be any tuning options, short of an ECU replacement system, for the Series II. I also sent email for more information. Any updates about the DP tune? So far no one has taken us up on this offer. I sort of thought somebody would jump at the chance for a free remap. I had emailed on Jan 4 - just resent today. In that email I included a before and after run with Racing Beat V2 and no cat. I am able to have before (stock 2005 with cat) and after (your software with cat) dynos because my Racing Beat V2 software is on a separate ECU and I only ran without a cat for that test. I also emailed, but my car is in the garage for the winter. I won't be able to do the first dyno for a couple of months, at least. I expect I'm out of the running for the free offer to the first person who sends in the PCM/ECU. I'll have to check back in once the car is running again. I'm interested. But I should let you know my situation. I recently upgraded from a series 1 manual to a series 2 auto that has 11k miles and still under factory warranty. Reasons for switching aside, I find it very annoying that the car will downshift for me in manual mode (only particularly concerning when I'm on the highway and only giving it slightly more power) An HP increase would be welcome considering the 20 less it has over the manual. My concern is that if I need warranty work in the future Mazda will figure out I have a custom tune and deny coverage. Well I won't tell you that you should ever try to "cheat" the warranty, but I will tell you this; the remap we do, unlike what Cobb did, is transparent to the factory level diagnostic equipment. So unless you do something really dumb, there should never be any reson for the dealer to even know you have a flash. Ok, next question, how long would this process take? And last question, I use this car as my Daily Driver, and want to make sure that if I do meet you in TN and the remap has issues for whatever reason I can get it back to factory mappings to be able to come home. A good question; the service takes several hours to do, simply because we write each file for each car. As far as return to stock, sure thats easy, we always keep each car/owners original and tuned files in our database for just that reason. In the immortal words of Napoleon Dynamite, "Lucky." Well, I guess that's really just a word, not words. Interesting. Would dynotune care to elaborate on what changes they would make on this tune? Will you adjust OMP rates, Fan on temps, eliminate DTC's? We have complete control over all of the tables in the Denso ecus. The tuning is,as I said, based on each car. With ecu based dataloging, from your car, we can do simple fuel and timing changes,rev limit increases, ect. I have never been asked to increase or decease the oil pump volume, and frankly never had reason to change fan cylce values, but it is doable. Sounds good. increasing the OMP volume for those running the SOHN adapter (and those still stock) will aid in both cooling and lubrication. The factory setting for the fans is 206F, In a hot Texas summer on the track or stuck in traffic it is nice to have them come on earlier and stay on longer. Are you looking for beta testers for a series I. 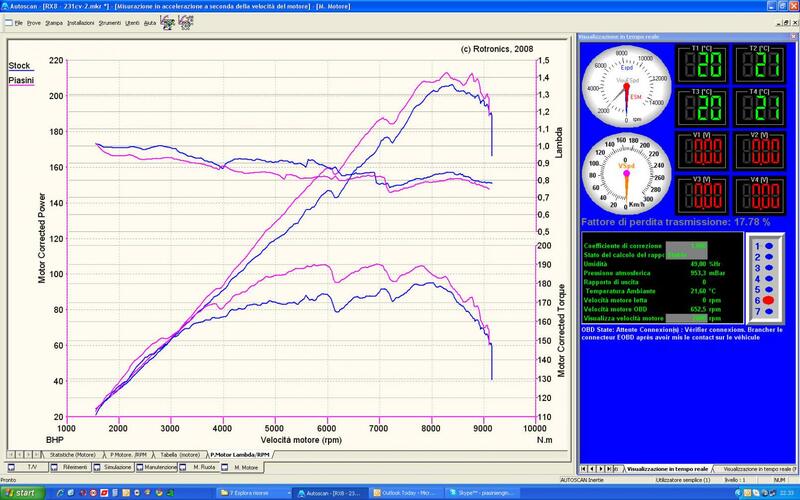 What kinda gains in whp and wtq did you see on the Gen 1's that you've tuned thus far? OK, I'm sold, where in Texas and can I meet you on a Sat? I would like to take you up on the Free Remap! Last edited by Riley Craven; 01-23-2011 at 10:03 AM. Riley, we are in New Braunfels, about 30 min north of San Antonio. Italian software and OS? Where was this done? S2 rx8s aren't imported here. Piasini is well known for blowing stuff and crap tunes here. Hmmmm 210HP to the wheels on a stock S2? Now I am very skeptical, real S2 race cars are only making 40 more HP than that with stand alone ECU's, Custom header, exhaust, intakes, etc., etc. But I guess we will have to see for ourselves before we can discount it.